There are hundreds of things that you can do with your Chrome New Tab Page. 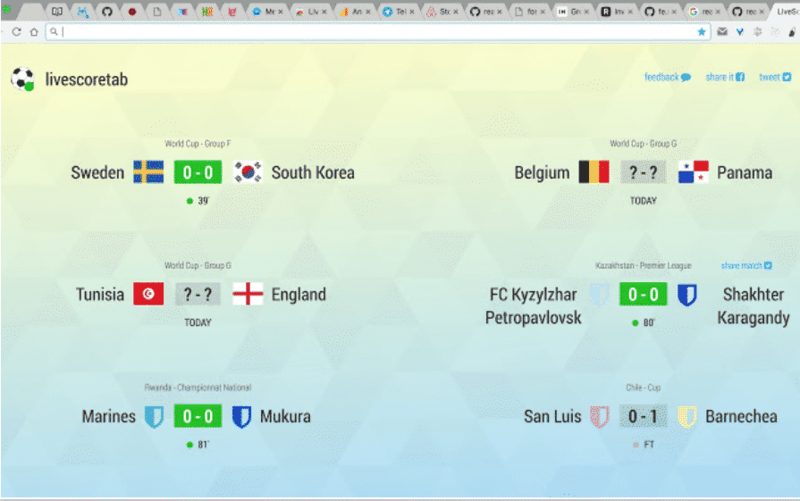 This World Cup season, consider making it a place to put live score from all the World Cup games. If you are a soccer fan, this extension is going to be really this World Cup season. Once installed, you will see live scores for all the soccer games from around the world, including the World Cup. The extension comes with easy shortcuts to share the scores on Facebook and Twitter. Other than that, this extension is a simple affair. Give this a try by installing it from the Chrome Web Store here. Remember, do not install extensions or apps from anywhere other than the Chrome Web Store. This is a new extension with only a few dozen installs. I would recommend reviewing the extension before installing it.